It is an understatement to say that Jerry Seck has a big personality. A booming voice, an innate aptitude for networking, an unmistakable air of confidence and … let’s say a flair for fashion, combine to make Jerry a conspicuous figure in nearly any crowd. 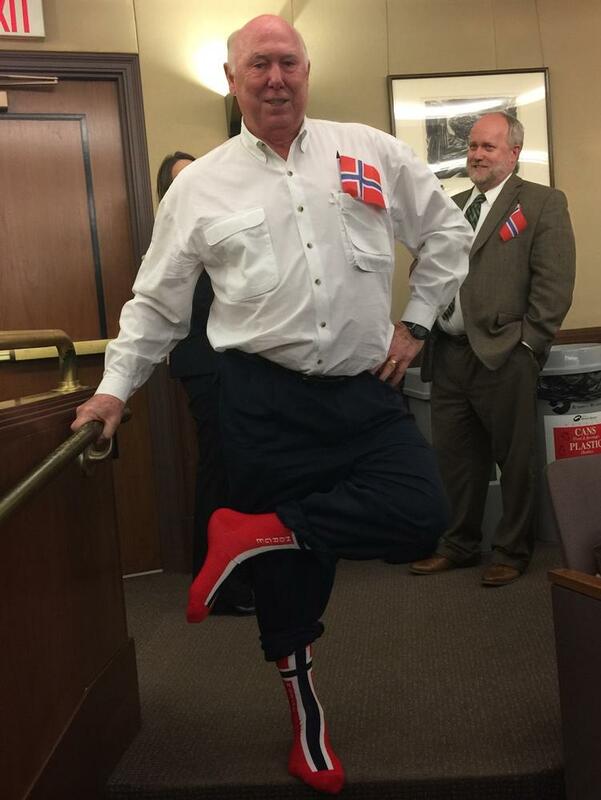 While those traits are obvious to the casual observer, it is for a less evident component of his personality that Jerry Seck was recently awarded the Medal of Saint Olav from King Harald V of Norway. 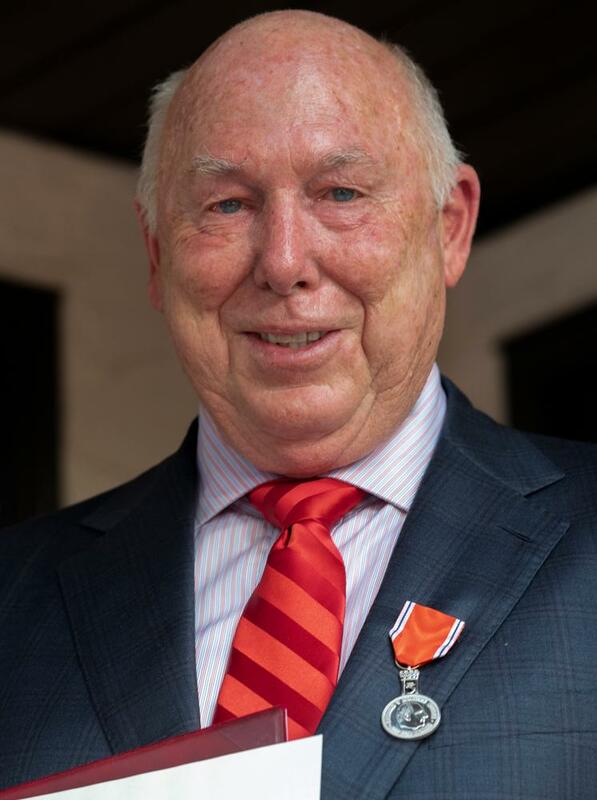 Jerry was awarded the medal on May 23, 2018 by Eivind J. Heiberg, the Honorary Consul General of Norway, in a ceremony at Jerry’s St. Paul home. He was nominated for the award by his friend Advocat Yngve Hanisch, of Oslo, Norway. The Medal of St. Olav dates back to 1939 when King Haakon VII established the award. It is given in recognition of those who act as advocates for Norway and who work to build relationships between Norwegians and expatriate Norwegians. Jerry was also recognized with the award, in large part, for his work with Vinland National Center in Loretto, Minn.
His work with Vinland began in 1986 when he was asked to help revitalize an ailing sports medicine treatment center established 10 years earlier with funds from Norway’s Bicentennial gift to the United States via President Gerald Ford. Jerry took a 10-year-old facility with no staff, no clients and mounting debt and began the process of transforming it into a treatment center. Today, Vinland is a flourishing 61-bed residential facility with additional outpatient services that helps adults with cognitive impairments to lead a more normal life and those with drug and alcohol addiction to overcome their addiction. In addition to his service at Vinland, Jerry was recognized for his work as a mentor for Norwegian law students through internships at Larkin Hoffman. Since 1995, Jerry has mentored 22 aspiring lawyers from Norway and hosted them as guests at his home. Throughout the years, he has hosted six other students from Austria, China, El Salvador and Minnesota. As an attorney, Jerry has been a lobbyist at the Minnesota Legislature since 1971. He represents a variety of clients, including governmental entities and private organizations. Jerry has been a member of Larkin Hoffman’s government practice group since 1984. Jerry is known nationally for his connection to the U.S. Supreme Court case, Bryan v. Itasca County, which is a landmark 1976 case in American Indian law. Jerry represented Russell Bryan, an enrolled member of the Minnesota Chippewa Tribe residing on the Leech Lake Indian Reservation, who was appealing an Itasca County property tax. The case reached the United States Supreme Court, which unanimously ruled in favor of Bryan. The ruling is widely credited with setting the foundation for the American Indian gaming industry.